Engaging people in creating a sustainable future through local efforts to reduce, reuse and recycle. Our campaign is expanding outside the Portland city limits: We have recently added two shops in Gresham, Core Coffee and Intent Coffee. Here is a list of the coffee shops outside of Portland. If you live near one of them, or pass by on your travels, make sure you stop by, and as always, BYOC! We're always happy to hear from you if you have feedback, or if you'd like to get involved with RA, or if you know of a coffee shop we should connect with. Contact us at info@recyclingadvocates.org or 503-777-0909. Have you heard about Kink 101.9's new podcast Talking Trash? 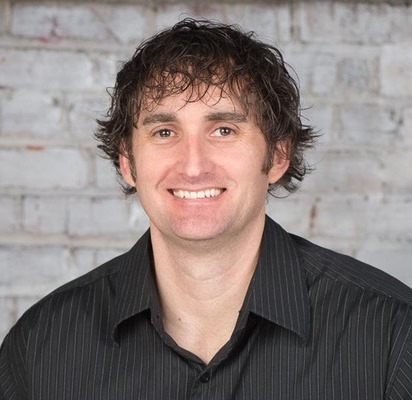 Episode 6 is just out and it features our very own Brion Hurley, talking with Peggy La Point about RA's origins, Zero Waste conferences and what - realistically - Zero Waste means for most of us. - All names that will be familiar to Recycling Advocates supporters and subscribers! You can listen to all the Trash Talks here: Talking Trash: a Green Tips Podcast. The City of Berkeley, California is once again on the cutting edge of the sustainability movement. The City Council recently passed an ordinance requiring restaurants and cafés to use only reusable plates and utensils for dining in. The ordinance also requires restaurants and cafes to charge patrons a 25 cent fee if they get their beverages in a single use To Go container. It states that restaurants may provide lids and stirrers only upon request. Apparently there was no opposition to the ordinance. The ordinance takes effect in January 2020. Here’s a link to the LA Times article: Berkeley Disposable-Free Dining. Question for our readers -- What should be OUR next steps? 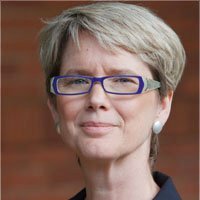 Is the time right to ask the Portland City Council to pass a similar ordinance? Please contact any of us at Recycling Advocates if you would be willing to get involved. Thanks! You may have thought that the answer to the single use plastics issue is to just use compostable utensils or compostable plates, etcetera. It may come as a surprise to find out that compostables are not the answer to the problem. "City of Portland compost programs are not a viable solution. Single-use compostable or biodegradable plastic serviceware items are a major cause of contamination in Portland’s current composting program. These items create quality issues for compost facility operators and ultimately jeopardize their business through contaminated feedstocks of material. Well, this is certainly food for thought and points us back to the essential answer which is to just say NO to single use containers and utensils whether they are plastic or compostable. They still get thrown “AWAY” and away is not a good solution. Bringing your own cup, your own TO GO container and even your own utensils just takes a bit of commitment. 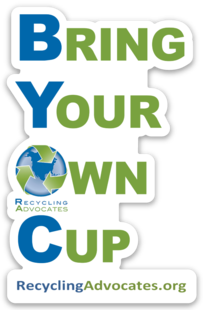 Join Recycling Advocates in pledging now to Bring Your Own Cup. Note from the Editor: It's not only in Portland that products labeled "compostable" are problematic. Here's an article from the EcoLunchbox blog on the same topic: When Compostable is sometimes worse than plastic. Their conclusion is the same - labeling products as compostable is often just "greenwashing", so whenever possible reduce, reuse, and Bring Your Own! 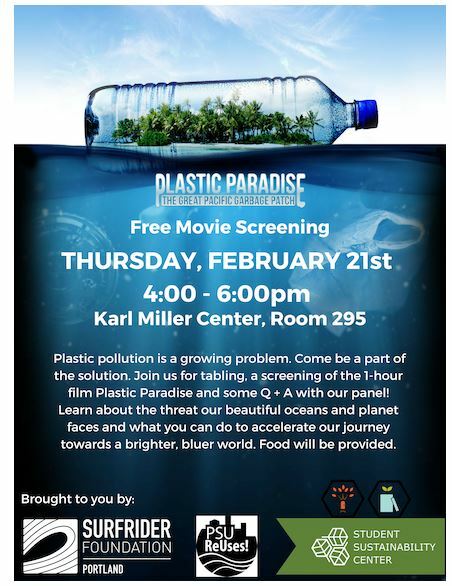 Head to the Karl Miller Center on the PSU campus today at 4:00 PM for a free screening of Plastic Paradise followed by a Q&A. This event is sponsored by the Surfrider Foundation Portland Chapter, Sustainability at Portland State University, and PSU Reuses. About The Film Plastic Paradise: Thousands of miles away from civilization, Midway Atoll is in one of the most remote places on earth. And yet its become ground zero for The Great Pacific Garbage Patch, siphoning plastics from three distant continents. In this independent documentary film, journalist/filmmaker Angela Sun travels on a personal journey of discovery to uncover this mysterious phenomenon. Along the way she meets scientists, researchers, influencers, and volunteers who shed light on the effects of our rabid plastic consumption and learns the problem is more insidious than we could have ever imagined. 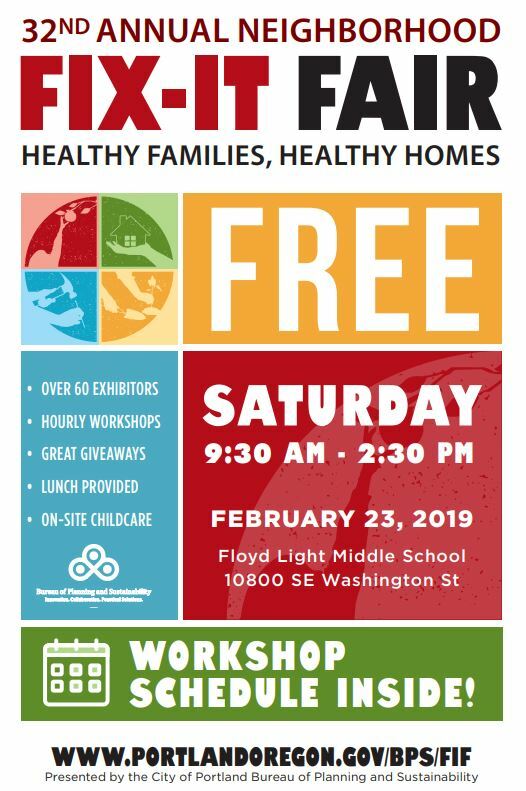 The final Fix-It Fair of the 2018-19 season is this Saturday at Floyed Light Middle School, 10800 SE Washington St.
As well as the Repair Cafe there will be free workshops throughout the day (see the schedule here: February Fix-it Fair Workshops) and also translation services from a number of talented multi-linguists - Spanish, Russian and Ukrainian interpreters will be onsite all day. We'll be there with BYOC info and to answer people's recycling questions, so stop by to say hello, pick up BYOC stickers and buttons, and sign the BYOC pledge! For details of this and other local area "green" events see the Events Calendar on our website. Become a member of Recycling Advocates and help us continue to spread the word about waste prevention. By Mail: print and complete our Membership Form, mail it with your check to PO Box 6736, Portland, OR 97228-6736. PayPal: use the button below to donate via PayPal using your credit card, bank account, or Paypal balance. Gifts of any amount gratefully received. Join at "Friend" level or above to be eligible to receive a Recycling Advocates/Rooster reusable coffee cup. We thank you for your passion, support and commitment to protecting Oregon’s environment! Here are some ways to contribute to Recycling Advocates that won't cost you a penny. 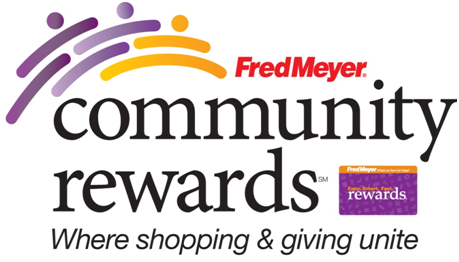 Fred Meyer Community Rewards: shop with your Fred Meyer Rewards Card, continue to earn your rewards points, fuel points and rebates, and Fred Meyer will donate to Recycling Advocates! Sign up here, and select Recycling Advocates, nonprofit number 90398. Amazon Smile: Amazon donates .5% of the price of your eligible purchases to RA whenever you shop at smile.amazon.com. You'll see all your usual account settings and exactly the same products and pricing as at amazon.com. Learn more and sign up here. GoodSearch & GoodShop: Support RA and save money at Goodsearch.com and Goodshop.com. Find store coupons, coupon codes, discounts, deals and promo codes. Join here and select Recycling Advocates. Copyright © 2019 Recycling Advocates, All rights reserved.